Rapid urbanization and climate-related disasters constitute challenges for peri-urban areas in Indonesia. Integrating disaster risk reduction and climate change adaptation into development planning is essential to prevent and minimize the impacts of these challenges. This study focused on the development plans of South Bandung, part of Metropolitan Bandung, the third biggest metropolitan area in Indonesia. This study attempted to assess to what extent the local government of peri-urban Bandung has included disaster risk reduction and climate change adaptation in its development planning. Several approaches and methods were employed: content analysis of development and spatial plans, interviews with key informants (including local government officers, researchers, non-governmental organization officials and community leaders), field and institutional surveys. The study directly supported the research roadmap of the Bandung Institute of Technology on disaster mitigation and public policy development. The findings suggest that local development plans in the South Bandung Area do not include strong climate change adaptation and disaster risk reduction components. Plans take into account environmental aspects of climate adaptation but disregard other important dimensions, such as those related to infrastructural, social, economic and health issues. When the local government has adopted measures to reduce vulnerability in disaster-prone areas, including improving drainage systems, or building a water storage pond, they have not done so deliberately as part of a disaster risk reduction program. 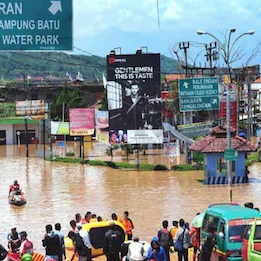 A lack of deep understanding of climate adaptation and disaster risk reduction, together with the specific characteristics of peri-urban areas, could be the cause of South Bandung’s failure to include them in its development plans. It is important to increase awareness of these challenges, so that local governments can take the most appropriate measures to decrease the vulnerability of the local communities. The preliminary findings of this study were presented during the Indonesia University of Education (UPI) International Geography Seminar in August 2017 in Bandung. It is hoped that the local government of South Bandung, as well as other cities, will use these lessons learned and inputs to develop policies and plans.